One of my favorite things to gather from you guys on Instagram are responses to an “Ask me anything!” poll. 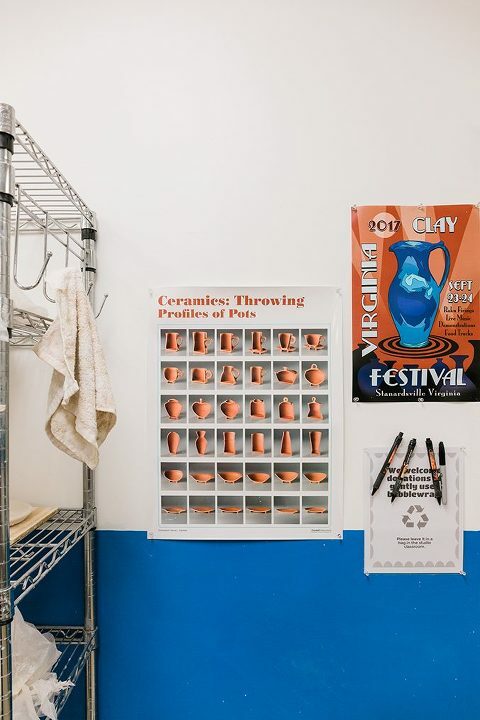 I get so many interesting questions in return, but one that really surprised me recently was this one: What’s your arrangement at the pottery studio? It caught me off guard because I hadn’t realized that I was doing such a bad job explaining the situation! I think it can honestly be hard for me to have good perspective working by myself from home. Unless I hear from you guys in the comments or on Instagram polls, like the one I mentioned above, it can sometimes feel like I’m talking to myself. I know that’s not the case thanks to the sweet messages I do receive, and that it might be hard for you to be able to picture my side of things (I totally get it! ), but the truth is that I might not be quite as forthright with little details because I wonder if I’ve already mentioned it, or I incorrectly assume that you’re right here with me on a daily basis and already know. Silly, I know! Thankfully, the ambiguity is about to go away because today I plan to break it all down so you can get a good sense of how it all works. First, let me take you back to the beginning in case you’re new around here. It was January 2018 and I was just coming down off a mental New Year’s high. I was still enjoying my winter break holiday, and so I had plenty of time on my hands to think about what I wanted to do with 2018. I had seen an advertisement for a local pottery class at a place called Make Waynesboro on my Instagram feed, and happened to mention it to my sister and John. They immediately encouraged me to go for it, and even though it took about a week and a half for me to gather up the courage, I did sign up for it. Those initial weeks of my first class were really hard and humbling for me, but after a few weeks I slowly started to get the hang of things. 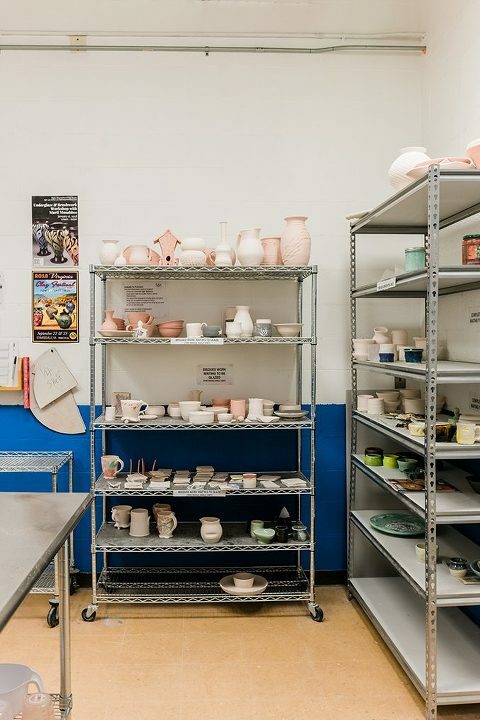 I fell in love with pottery and went on to sign up for four or five more 6-week classes before finally deciding to become an official member of the studio (and, later, opened an Etsy shop!). At our particular local studio, people are welcome to sign up for one-off classes for a fee, which is what I did for about four months. Then, after signing on as a monthly paying member, I was able to come into the studio whenever I wanted and I was also able to get a discount on classes. I continued to take classes, and also started a regular Monday/Wednesday/Friday morning schedule at the studio so I could work on my own at the wheel outside of classes. Now, I should probably explain something about myself. When I want to learn something new, I want to learn every single thing I can about it. 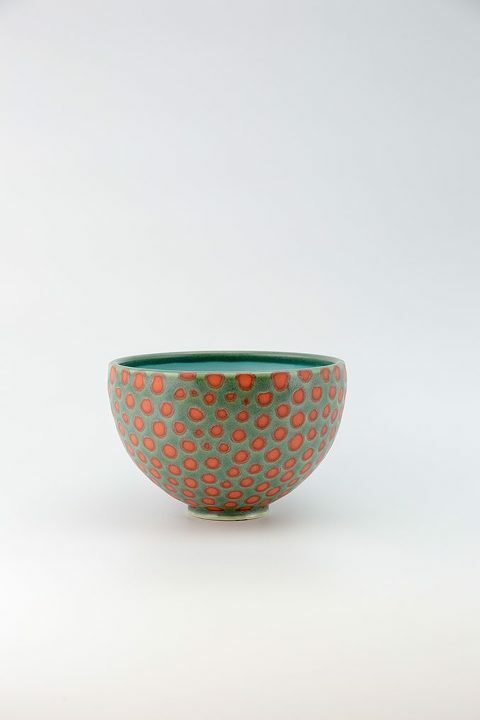 So, after deciding that I might want to do pottery on more of a full-time basis than I had originally set out to, I started asking the owner of the studio lots of questions that went a little beyond what he taught in the wheel-throwing classes that I had taken up until that point. Happily, he seemed more than willing to offer the extra info, and I guess I was so persistent that he eventually offered the role of Studio Assistant to me. 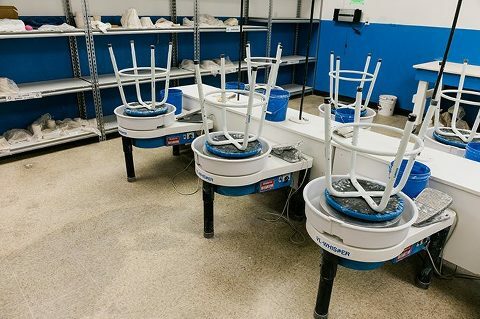 There are a few other people at the studio who do this, but basically, the studio assisting consists of things like loading and unloading the kilns, helping with organization projects, painting, tool storage, clay reclaiming, and all sorts of other things. I basically help the owners, Jake and Katie, and the other studio assistants keep up with all the things that go along with running a community pottery studio. I also eventually took on the role of managing the studio’s Instagram account since I mentioned having an interest in that, too. I dedicate roughly 1-3 hours a week of my time at the studio to this role, and in exchange I receive a generous discount on my membership, plus lots of really valuable insight into the inner workings of life as a professional potter. But beyond that, I guess I showed so much of an interest in pottery that the owner offered me a paid position as his own personal assistant, too. So, in between helping out around the studio, I also help Jake with his pottery production process, doing things like weighing and wedging clay so he can quickly make mugs and vases, waxing the bottoms of his pieces before we glaze them, and I also help with his multi-step glazing process to make the more repetitive steps easier on him as he works to fulfill gallery and wholesale orders. I included several photos of his pieces in this post so you can visualize how I might help him on a daily basis. The spotted pieces, in particular, that you see throughout today’s post are one of the more involved things I get to help with. Other than glazing, I help Jake with a few photography projects, and we also most recently collaborated on redesigning the tags he uses on his pieces when he sells them at galleries and shows. So, that’s a pretty long-winded way of explaining the whole situation, but I hope it gives you better insight into how it all works. I’m still very much in the learning stage and taking every chance I can to try new things, so I’m excited to see how it will all play out in the next year—and, hopefully, many more after that. Feel free to leave any lingering questions in the comments, and if you happen to have found this blog because you, too, are a potter, I’d love, love, love to hear how your studio arrangement works. Do you have your own space, or do you work in a community studio like I do? If it’s the latter and you’re hoping to take on a bigger role, I can’t encourage you enough to start asking questions. Who knows where it could lead!